Shake with ice and strain into a cocktail glass. Garnish with a green olive (omitted, and instead garnished with a lemon twist). Two Fridays ago, I was scanning through the brandy section of Pioneers of Mixing at Elite Bars: 1903-1933 when I spotted the Black Rene. Overall, it seemed like a brandy-forward and Maraschino instead of triple sec variation of the Between the Sheets, and it seemed worthy of a try. The Black Rene's bouquet was filled with lemon, Maraschino, and caramel notes from the rum. 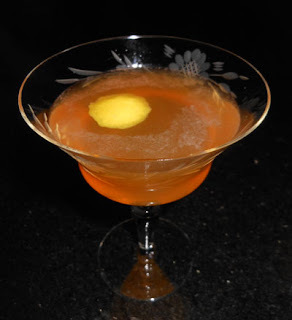 A slightly tart lemon-caramel sip led into brandy, rum, and Maraschino flavors on the swallow. Moreover, as the drink warmed up, it became a bit more grassy and rhum agricole-like; Andrea surmised that the Maraschino played a role modifying or pushing this flavor forward. The lemon twist looks like a much better garnish to me. Cheers! I always worry that the lack of olive or pickled onion will deprive a savory note (salt and/or vinegar besides the vegetal note from the infused brine) to the drink. Rarely enough to make me put in a garnish that I won't eat though.